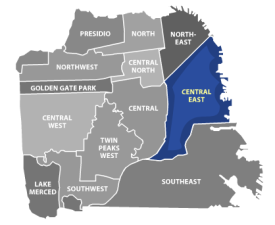 The central-eastern portion of San Francisco, District 9, is a sector in transition. Although some neighborhoods of the district have traditionally been residential, other areas were once home to warehouses, factories, shipping yards, and industry. Gentrification has not yet had a substantial impact on the eight distinct District 9 communities of Bernal Heights, the Central Waterfront / Dogpatch, Inner Mission, Mission Bay, Potrero Hill, South Beach, and South of Market (SoMa), but things are beginning to change. Real estate in these neighborhoods is still moderately priced, but as District 9 evolves the transformation is likely to be reflected in home prices. AT&T Park, home to the San Francisco Giants, and parts of the Inner Mission District are two well-known locations within the boundaries of District 9. Less well known is the community of Dogpatch, a nine-block area that, having escaped the destruction of the 1906 earthquake and fire, boasts some of the oldest homes in San Francisco. Each neighborhood has a distinct character; the Mission area is the vibrant and colorful heart of the Latino community, Potrero Hill and Bernal Heights have family-friendly small town atmospheres, while SoMa, South Beach, Yerba Buena and Mission Bay have edgier city vibes. The face of residential real estate in District 9 is evolving. Cottages, bungalows, and single-family homes help give Bernal Heights and Potrero Hill their friendly neighborhood feel, while SoMa, South Beach and Yerba Buena are being transformed by an infusion of lofts and condominiums. Easy access to Highway 101, I-280, and I-80 make commuting to all points north, south, east, or west straightforward and convenient. District 9 has an interesting, and still affordable, mix of real estate. Architecture ranges from small, single-family cottages to glittering contemporary lofts and condominiums. Homes in District 9 tend to be moderately priced (by San Francisco standards), and with due diligence a real bargain may be found. For more information regarding real estate in San Francisco's District 9 area, contact us at San Francisco Modern Real Estate.